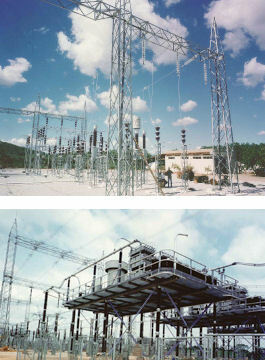 SAE Towers manufactures a wide variety of outdoor electrical substation structures, including lattice, tubular and wide-flange steel support designs. Fabrication of substation structure elements often utilizes complex full or partial penetration welding, processes we have successfully performed repeatedly through the years. We specialize in structures requiring pre-qualified welding. From in-service deflection limits to special grounding requirements, we also understand the critical needs of transmission line termination structures, designing and manufacturing to your unique specifications. For new substation structure designs, we use the concepts of ASCE’s Substation Structure Design Guide (MOP 113) as well as ANSI’s Recommended Practices of Seismic Design of Substations (IEEE-693).